Using standard D-cell alkaline batteries, the Collision Sentry detects motion coming from two directions at the same time and flashes bright red LED lights and sounds audible alarms to warn traffic of impending collision danger. The alarm has adjustable volume control so that the warning beeps are as loud or as quiet as necessary for the environment. This portable infrared detector mounts using either magnet mounts or z-clips to hold the device in place. A security tether is added to prevent the device from falling to the floor if it is struck hard enough to dislodge it. Magnet mounts are included and make attaching to pallet rack (or other metal objects) extremely quick and easy. Z-clips are used when attaching the device to a non-magnetic surface. The detector is ready to use right out of the box and includes six (6) D-Cell batteries. 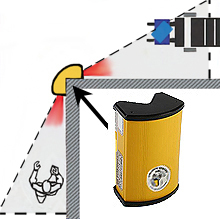 Protecting against injury and collision damages, this portable detection device helps prevent your work force from being counted among the nearly 19,000 people hit by forklifts annually. On guard 24/7, this infrared detector keeps watch over blind corners, entry ways and rack aisles, always ready to warn forklifts and pedestrians of the potential for a collision. The Collision Sentry works by monitoring for infrared light within its sensor range. When objects are detected from two or more directions at once, high visibility LED flashing lights are triggered to warn oncoming traffic. This passive infrared motion sensoring technology is a proven technology also used in security lighting and alarm systems, so you can be assured of its dependability. The warning lights will flash constantly when there is reduced battery power long before actual replacement is required, so you need not worry that the Collision Sentry will go "off-duty" at a critical time. Mount the Collision Sentry 7-9 feet high for best visibility by both forklift operators and pedestrians. Mounting is accomplished by placing magnet mounts on the corner of pallet rack or other steel object. The device has a V-shaped back with a large magnet on each side of the "v". Simply attach the device to the mounted magnets, then secure with the included tether to prevent the device from falling to the floor, should it get dislodged. Sensor takes six (6) D-cell batteries to operate. Battery life is 2-1/2 to 3 years before replacement.